EDITION SÄNTIS (40% VOL.) The aging in oak beer barrels and the graceful apple wood smoke flavor gives this whiskey a pure, delicate and seductive freshness. The hint of green fig on the silky texture and a subtle touch of swing with phenol in the background. 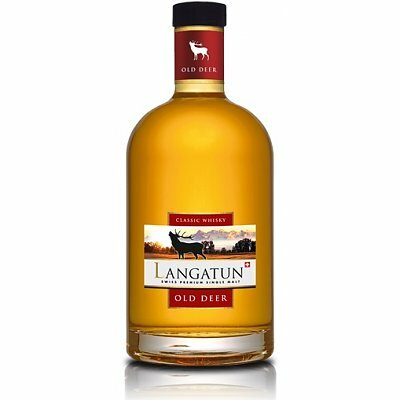 De Langatun Old Bear Smoky Peated is een geturde Zwitserse single malt van de Langatun distilleerderij. Een eerbetoon aan oprichter Jakob Baumberger die ooit de beer gebruikte als het logo van zijn distilleerderij en brouwerij. Distilled: January 2009 Bottled: Januari 2015 Sherry / Chardonnay The "Old Deer" is our classic Single Malt whisky which is why we also call it "Classic". It is a 100% pure barley-malt whisky produced from a mixture of peat-free malt of the best European provenance and fermented with a specially selected English Stout yeast. EDITION SIGEL (40% VOL.) Although this edition is matured in oak barrels for beer, seems a jump the grape downright from the glass counter. If you have sniffed at this exclusive flavor, the water runs a downright salivating.